The Certified Neuroscience RN certification provides recognition for a level of excellence in nursing care for the patient with a neurological condition. These Registered Nurses work with neurosurgical patients throughout all phases of their treatment, in spinal cord injury centers, and with patients who suffer from chronic neurological disorders. Prepare with our CNRN Study Guide and Practice Questions. Print or eBook. Guaranteed to raise your score. Get started today! In order to take the Certified Neuroscience RN exam, the applicant must be a licensed Registered Nurse who has worked at least 2 years full-time, or 4,160 hours, in Neuroscience Nursing. This can be as an educator, providing direct patient care to neurological patients, or as an administrator. There are no specific continuing education hour requirements for initial certification. The Certified Neuroscience RN exam is offered twice a year. There are two days out of the year when a written exam can be completed at limited testing sites across the country. There are two 1-month windows in which a computer-based exam can be taken at various testing sites across the United States. The exam fee is $250 for members of the American Association of Neuroscience Nurses (AANN) or $335 for non-members. The fee to join both the AANN and register for the exam is $348. CNRN Flashcards. Proven CNRN test flashcards raise your score on the CNRN test. Guaranteed. The Certified Neuroscience RN exam consists of 220 questions, of which 20 of these are sample questions to be tested for possible inclusion in future exams. The exam contains questions pertaining to all aspects of the nursing care for the patient with a neurological condition. It covers neurological trauma, neurosurgical issues, rehabilitation for the patient with neurologic compromise, and specific disease processes that affect the neurologic system. The Certified Neuroscience RN certification is valid for 5 years. At the end of that time period, the RN must have completed at least 2 ½ years of full-time employment as a Neuroscience Nurse, or 4,160 hours. In addition, at least 75 continuing education hours must have been completed. The RN may have also completed at least 14 ½ months of employment as a Neuroscience Nurse, or 2,500 hours, and attained at least 100 continuing education hours. The cost of recertification is $215 for AANN members, $300 for non-members, or $313 to join the AANN and recertify. Explore our free CNRN review provided by Mometrix. 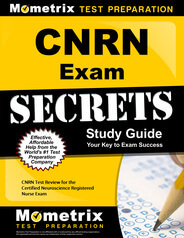 Check out our premium CNRN study guide to take your studying to the next level. If you benefit from these materials, just click the link below! 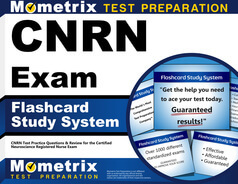 To compliment our CNRN book, we also offer extensive CNRN flashcards for even more CNRN test prep help. We hope you enjoy our products! Your purchase helps us make more great, free CNRN certification content for test-takers just like yourself. 1. Which is the most accurate statement concerning antibiotic therapy for bacterial meningitis? 2. Which of the following is NOT an important nursing intervention in the care of a patient with viral meningitis? 4. Which is the MOST important element of patient education for the patient being discharged from hospital after diagnosis and early treatment of Lyme disease? Treatment for bacterial meningitis is urgent; the risk of mortality is too great to wait for a definitive bacteriologic diagnosis. Drug selection targets the organisms most likely to be present on clinical grounds and on the known antibiotic sensitivities of those organisms in the region and in the specific institution. These sensitivities vary geographically and evolve over time. Because of the seriousness of the infection, bactericidal antibiotics are preferable. If dexamethasone is included in the treatment regimen, it should be started before – or at least concomitant with – the first dose of antibiotic as the first phase of bacterial death can intensify the inflammatory response. Unlike bacterial meningitis, viral meningitis cannot be transmitted from person to person via direct contact or airborne secretions. The viruses that cause aseptic meningitis in humans are called arboviruses and are transmitted by mosquitoes. Some of these viruses also cause encephalitis. Serial neurologic examination is important to detect focal neurologic abnormalities as soon as they develop, since viral meningitis is often accompanied by encephalitis. Some focal deficits can be life threatening, such as dysphagia. Any deterioration in level of consciousness should also be noted as promptly as possible so that the cause can be addressed, for example, by reversing increased intracranial pressure. Deteriorating level of consciousness is a poor prognostic sign. Hyperthermia in any setting can result in permanent brain damage. any evidence of a clotting disorder, because bleeding into the limited spinal subarachnoid space can produce a hematoma that entraps or compresses the cauda equina. The physician will already have assessed the risk of herniation due to increased intracranial pressure with or without a space-occupying lesion. It is advisable to have the patient attend to bathroom needs prior to the lumbar puncture so that he doesn’t have to sit or stand following the procedure, but this is a lower priority than checking the coagulation studies. No restriction of food or liquid is necessary prior to lumbar puncture. Patient education is a part of preparation for any procedure, but again, the most pressing nursing intervention is to review the coagulation studies. Lyme disease is caused by the spirochete B. burgdorferi, which is not quickly killed by antibiotics. If the diagnosis is made before neurologic, cardiac, or joint involvement, then antibiotic treatment can usually be completed orally at home. The patient needs to understand that treatment is not complete until the last prescribed dose has been taken. IV antibiotics may be required if the disease has progressed to involve the CNS, heart, or joints. In that case, the patient will remain in hospital or be discharged home with home nursing support. In either case, completing the entire course of treatment is essential. The patient should understand that especially if treatment has been started early in the course of the disease, he is very likely NOT immune to subsequent infection with B. burgdorferi, because his immune system may not have had sufficient time to mount an effective response. The patient should understand precautions against repeat infection. The infective agent is tick- borne, so the patient should avoid wooded environments and use insect repellents and wear protective clothing whenever he cannot avoid tick habitats. He should inspect himself and his pets regularly for ticks and understand the correct and incorrect methods for removing any ticks he may find. B. burgdorferi is not transmitted from human to human, so isolation is not required at any stage. The patient should be aware that Lyme disease is a chronic illness, and many individuals experience intermittent long-term symptoms such as arthralgias, headache and lethargy, but actual permanent joint damage is, in fact, unlikely. The goal of disease-modifying treatment for multiple sclerosis is not cure or reversal of existing symptoms. Rather, the goal is to reduce the frequency and severity of exacerbations and to delay development of disability. For this reason, patients are easily frustrated even by successful therapy, because they cannot see concrete, positive improvement. Patients and their families often benefit by repeated reminders about the actual goals of treatment, even if they are not expressing frustration. Since depression can be a primary symptom of MS, a reaction to a particular loss associated with the disease, or a side effect of interferon treatment, the treatment team should always be alert to possible depression, but the firstline intervention in this case is education. If the patient is doing well neurologically and not experiencing unmanageable side effects, it is not appropriate to propose changing drugs.